You can put lures & Hooks & covers and others in it. 1 Fishing Tackle Box. Material: Plastic. It made of hard quality and good quality. Main Color: Black. 20X(100% Brand New and high QualityMain Color: BlackMaterial: PlasticSize Approx: 11.4x7.2x3.4cmIt made of hard quality and good qualityIt is Strong and ReliableIts interior has many compartments. You can put lures & Hooks & covers and others in it.Every compartment has its own liftable lid. So it is quite convenient.Package included: 1 * Fishing Tackle BoxOnly the above package content, other products are not included.Note: Light shooting and different displays may cause the color of the item in the picture a little different from the real thing. The measurement allowed error is /- 1-3cm.) MPN Does not apply Brand Unbranded EAN 192948067433 UPC 192948067433 ISBN 192948067433. We are not interested in going fishing with the bare essentials and hope to get lucky. Here at LureCandy, we are all nice people and we in turn hope that all the anglers out there are nice people as well. You can put lures & Hooks & covers and others in it. 1 Fishing Tackle Box. Material: Plastic. It made of hard quality and good quality. Here at LureCandy, we are all nice people and we in turn hope that all the anglers out there are nice people as well. We work with common sense, which is getting very rare in the world now. The worst thing that can happen is that you get your money back. 4X(100% Brand New and high QualityMain Color: BlackMaterial: PlasticSize Approx: 11.4x7.2x3.4cmIt made of hard quality and good qualityIt is Strong and ReliableIts interior has many compartments. You can put lures & Hooks & covers and others in it.Every compartment has its own liftable lid. So it is quite convenient.Package included: 1 * Fishing Tackle BoxOnly the above package content, other products are not included.Note: Light shooting and different displays may cause the color of the item in the picture a little different from the real thing. The measurement allowed error is /- 1-3cm.) MPN Does not apply Brand Unbranded UPC 192948067433 EAN 192948067433 ISBN 192948067433 Designer/Brand Unbranded Manufacturer Part Numb. 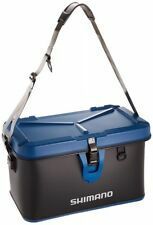 Roomy to hold your fishing tackle like fishing rod, line, float box, etc. 1 Piece Fly Fishing Rod Bag. - Constructed from hard PVC tubing and wrapped in a tough, water-resistant canvas fabric. - With adjustable shoulder strap. 3X(100% Brand New and high QualityMain Color: BlackMaterial: PlasticSize Approx: 11.4x7.2x3.4cmIt made of hard quality and good qualityIt is Strong and ReliableIts interior has many compartments. You can put lures & Hooks & covers and others in it.Every compartment has its own liftable lid. So it is quite convenient.Package included: 1 * Fishing Tackle BoxOnly the above package content, other products are not included.Note: Light shooting and different displays may cause the color of the item in the picture a little different from the real thing. The measurement allowed error is /- 1-3cm. UPC 192948067433 EAN 192948067433 ISBN 192948067433 MPN Does not apply Brand Unbranded. We'd like to settle any problem in a friendly manner. TSURINOYA Trulinoya 03 Fishing Box. Features: large space, freely assignable, easy to carry, waterproof, non-slip, using a chain buckle, built-in 16 grids are independent spaces. Hard Belt Bm-200 Hg Akirakuni. Very convenient place to find item information about Japan. We are located in Japan a suburban city of kyoto. Our Products are 100% Authentic. FODERO PER CANNE ZUN ZUN TR4 RIGIDO CON TRIPODE - SURFCASTING 2019. FODERO PER CANNE DA PESCA. HOBBY & JOB. VI RINGRAZIAMO PER AVERCI SCELTO. DIRITTO DI RECESSO. IL PRODOTTO ACQUISTATO VERRÀ SPEDITO SOLO A BONIFICO ACCREDITATO SENZA ECCEZIONE ALCUNA. NOVITA' 2018 TUBERTINI ART.88045. Sul pannello frontaleè presente una tasca utile ad ospitare il manico del guadino e paleria varia. Può ospitare due canne a tre basi parallele e cinque o sei kit con relativi tubi.